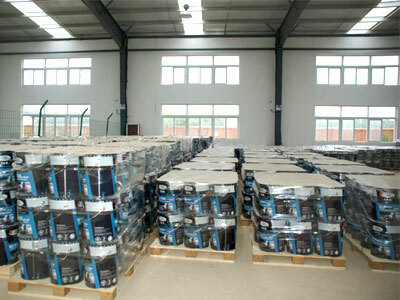 Two-component road marking paint is composed of base materials and hardener. During construction, just need to mix the base materials and hardener together with certain proportion. Due to chemical reaction, base materials and hardener quickly form hard paint film. 1. Good adhesion, hard coating, long service life even on busy traffic road. 2. Various construction methods, less requirement on construction equipment, easy construction. 3. Suitable for parking lines, pedestrian crossing, special lane and such kinds of city road markings. 1. Good cost performance. Its total cost is lower than that of thermoplastic marking. 2. Good adhesion of glass beads, excellent visibility in rainy day and at night. 3. Good rain dredge ability. 4. Hard paint film, good internal structure, non-deformation effected by temperature. And the swing structure marking can avoid damage to the marking caused by snow shovel.